Between the Presidio and Golden Gate Park, from Lone Mountain to Ocean Beach. 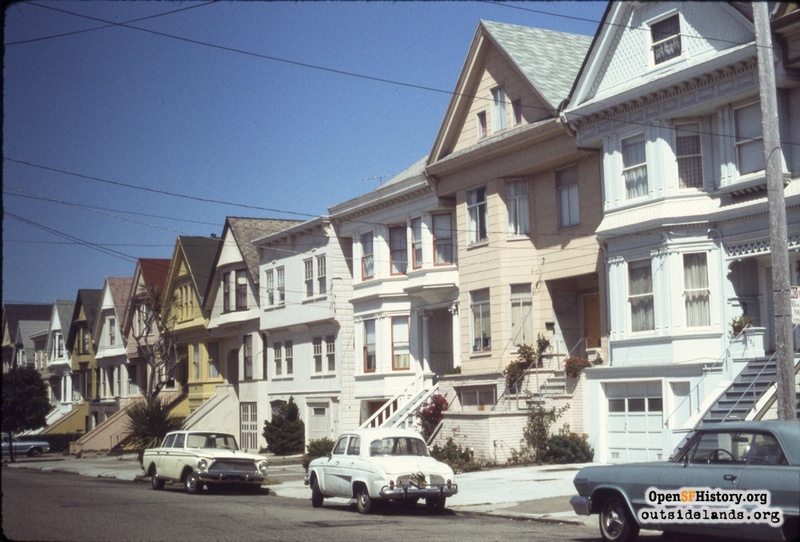 San Francisco's Richmond District neighborhoods include Anza Vista, Inner Richmond, Lake Street, Lands End, Laurel Heights/Jordan Park, Lincoln Park/Fort Miley, Lone Montain, Outer Richmond, Presidio Terrace, Sea Cliff, and Sutro Heights. The Richmond District lies between the Presidio and Golden Gate Park, and runs west from Lone Mountain to Ocean Beach in the northwest part of San Francisco. Cemeteries had been established around Lone Mountain in the 1850s and 1860s, but very few people lived west of them in the foggy sand and scrub. In 1863, the Point Lobos Toll Road and Cliff House were built, bringing traffic and some roadhouses, racetracks, and dairymen to the area. Traveling west to visit the beach and view the sea lions on Seal Rocks became a popular weekend recreation. In 1866, Congress passed the Outside Lands Act, officially adding the western half of the peninsula to the City of San Francisco and leading to the creation of Golden Gate Park. The park brought more weekend visitors and new transportation lines west, but full-time settlement on the sand and chaparral so remote from downtown was slow through the 1870s. The Richmond experienced slow but steady growth over the next twenty-five years, with large institutions such as hospitals and orphanages moving into the area attracted by the relatively inexpensive available land. New cable and electric streetcar lines formed to deliver passengers to the park, to the beach, and Adolph Sutro’s new Cliff House, Sutro Heights, and Sutro Baths. After the 1906 Earthquake and Fire, the displacement of thousands of San Franciscans downtown and a refugee camp along today’s Park-Presidio Boulevard brought scores of new settlers to the area. Between humble working-class cottages filling the rolling sand dunes, two of San Francisco's most prestigious residential enclaves were created. Baldwin & Howell made Presidio Terrace off Arguello Boulevard starting in 1905, and John Brickell Company worked with a number of firms to make Sea Cliff beginning in 1913. By the 1910s, a local improvement group, worried the neighborhood would be overshadowed by the rise of the city of Richmond in the East Bay, had the neighborhood’s official name changed to "Park Presidio." So it was called in newspapers and many city records throughout the 1920s, but “Richmond” stuck with people. In 2005, the city changed the name officially back.